Byrdie, who is an original member of the super group FTS, is the first member to release a solo project. Known to many as Pretty Byrdie or Dirty Byrdie, he is a sociopath with Multiple Personality Disorder. He is highly unstable with a mission to destroy the present condition of the hip-hop world. He is a kamikaze emcee held in high regards amongst his “Full Time Soldiers” and is considered to be a hip-hop icon by his many followers throughout the US. Byrdie has been seen with the Northwest’s most dangerous music chemist, Street Level Records very own Mr. D-Sane. Important government agencies and law officials have reason to believe that these two masterminds have constructed the worlds’ most dangerous virus known to man. It is a plague of pure poetry and catastrophic musical sound waves that are known to enter the human body through the ear. American scholars and scientists are completely baffled by this new phenomenon simply known as the “Poetic Epidemic”. What scientists do know is that this deadly virus is highly contagious and contains three stages of infection. The three stages are: “Brainstorm” – the virus enters the body through the ear canal and takes full control of the senses. “Kaoz” – the body begins to show signs of infection. These signs include eargasms, blood-shot eyes, uncontrollable head nodding and in the worst cases, violent convulsions. “Lyricide” – the body shuts down and fully submits to the virus. The first outbreak was discovered in July of 2001 in the Northwest region of the United States and is spreading like wildfire. Scientists predict within the next year and a half the whole world will be contaminated by the “Poetic Epidemic”. No one is immune and resistance is futile. 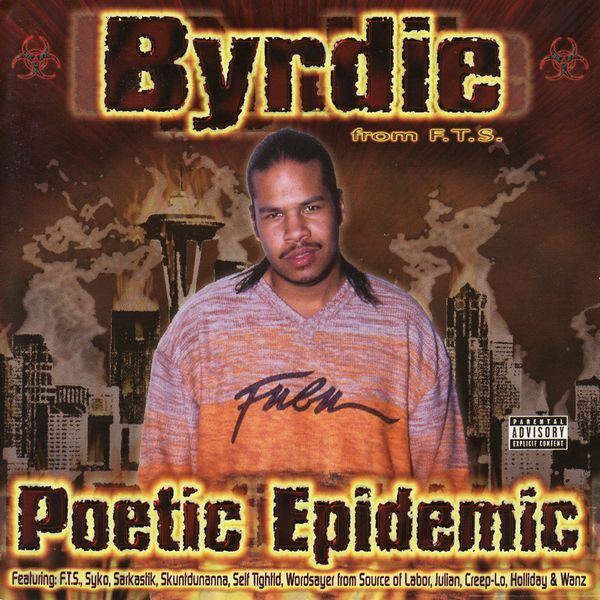 Dirty Byrdie and Mr. D-Sane have also allegedly involved some of the most deadly lyricists in the Seattle area. The CIA has been investigating the Street Level Militia for quite sometime and has discovered the identities of the accomplices who contributed to the creation of this deadly virus known as the “Poetic Epidemic.” Among these identified were the usual “Full Time” suspects such as: Mr. D-Sane, J-Dub, Madd Dogg and B.D. Other suspects include Sarkastik, Skuntdunanna, Syko, Self-Tightld, Holliday, Creep-Lo, Julian, Wanz and Wordsayer from Source Of Labor.